This lovely villa is located in the quiet neighborhood of Sunridge Woods in Davenport, Polk County, near to Kissimmee, Orlando and all the exciting Orlando attractions. 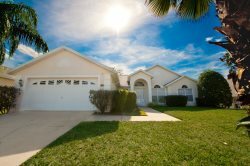 The villa is within five miles of the Disney World Theme Parks, as well as being close to two top class Championship golf courses - Reunion and Champions Gate. It's just a two minute drive to the local Publix Supermarket, Subway, Papa John’s, an ATM and many more shops and attractions. If the theme parks aren't for you then the golden beaches of the Gulf of Mexico and the Atlantic Ocean are both just about an hour and half away. Enjoy over 350 days of sunshine in Florida. The villa has 3 large bedrooms and 2 bathrooms; a master bedroom with a Queen Bed and en-suite bathroom. The second bedroom has a Full size Bed and the 3rd bedroom with 2 twin beds sharing the second bath. The kitchen is fully equipped with everything you might need for your vacation. There is a separate utility room equipped with both washer and dryer, Iron, Ironing board. Cable TV is offered in both the family room and the master bedroom. The Private pool with optional heating faces South, which allows you to enjoy the Florida Sun all day. Don't forget the sunscreen! This villa is located in a corner lot with plenty of yard for the kids to play and run.